For almost 15 years the doors of the Spin Palace Casino have been open in countries around the world. Anyone in Canada will quickly learn why the online casino has been so successful in other places when they decide to become a member. The casino is licensed to operate by the gaming Authority of Malta. Like the Spin Palace casinos operating in other countries, the Spin Palace casino in Canada has a combination of great games, outstanding bonuses and promotions, great customer support and plenty of banking options. They are committed to providing a gaming environment that is fair, safe, secure and fun. Spin Palace utilizes the software that comes from Microgaming. Microgaming has long been recognized as a leader in the software development that is used by online casinos. The games they offer are high quality. They offer great graphics and smooth play. All of the transactions that are done at Spin Palace are easy and safe thanks to the Microgaming software. Visitors to Spin Palace can choose from the more than 600 games that are available. They can also choose from the three different versions of the casino. Spin Palace offers a downloaded casino that is perfect for the PC at home. A flash version allows player sot enter the casino without downloading anything which is great when using a computer away from home. If a person is on the go, they can take advantage of the mobile casino that is compatible with almost any mobile device. The list of games that are offered is long and there are many popular titles. Slot machines such as Mega Moolah which offers a huge progressive jackpot are plentiful. Table games such as blackjack, baccarat and roulette are also ready for action. All of the games are very user friendly. A player will always be able to understand what is going on and can access their account at any time. For players that want a more realistic casino, the live table games that can be found offer a different way to play. The players at these table games can see a live dealer through a video stream and enjoy a game in real time. Spin Palace also brings for your Sports betting where you can bet on boxing, wager on horse races, darts matches or choose the Super Bowl to play at Spin Palace and you can find Fractional Odds, Decimal Odds, and American Odds, and Markets of all kinds available to you across an extraordinary amount of different sporting and betting events. Spin Palace Sports is supported by SBTech – a multi award-winning sports betting provider and is launched for all Canadian players, and coming soon to Europe. 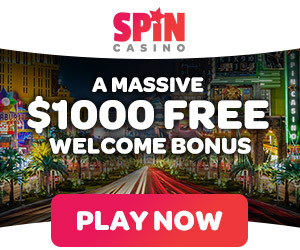 Spin Palace is generous enough to give you Huge Bonus that is free bet up to CA$200 when you indulge in sports betting. As part of the prestigious Spin Palace sports betting spin-off offers the same great service, safe and secure wagering and fair results. A fully mobile optimised product, Spin Palace Sports is available to access from desktop or on the go via your mobile device. New members at Spin Palace can earn as much as CA$1,000 in the form of matching deposit bonuses. The bonuses are available on the first three deposits a member makes. Returning players will also find various promotions that can earn them extra casino cash throughout the year. Loyal play is rewarded in the form of comp points. These points are accumulated every time a member signs in to their account and plays the games. The comp points can be redeemed for many rewards that include casino cash. Tournaments are held on a regular basis. Table games and slot machines all have tournaments held at Spin Palace. All deposits are done through a safe and secure connection. Electronic payment methods include credit and debit cards, Neteller, Skrill and UKash. Customer support is available through live chat 24/7, 365 days a year. Customer support can also be reached through a toll free phone number or email.